This tender pork loin simmers in its own succulent sauce, flavored by onions and herbs. 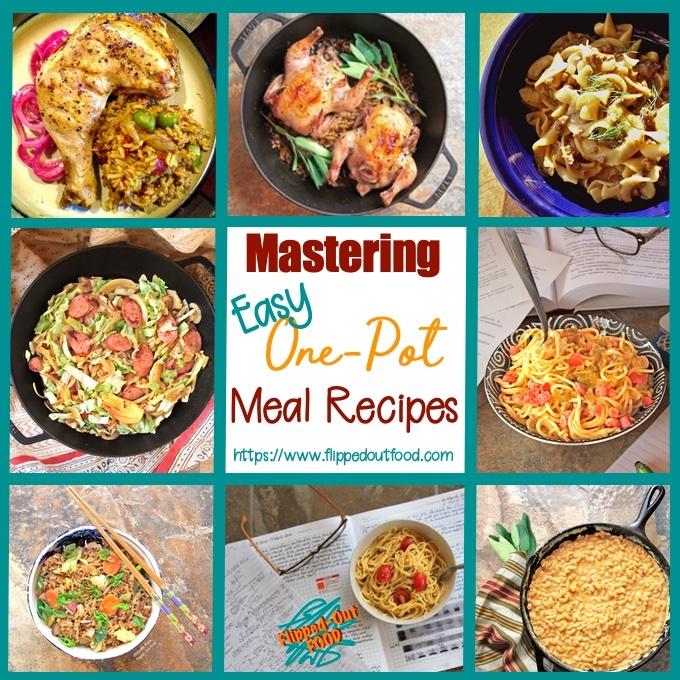 It’s a perfect weekend cooking project for a special Sunday Dinner. The sauce isn’t pretty, but you won’t care. Any leftovers are fantastic during the week. Mashed potatoes, polenta, or even rice would be a lovely accompaniment. 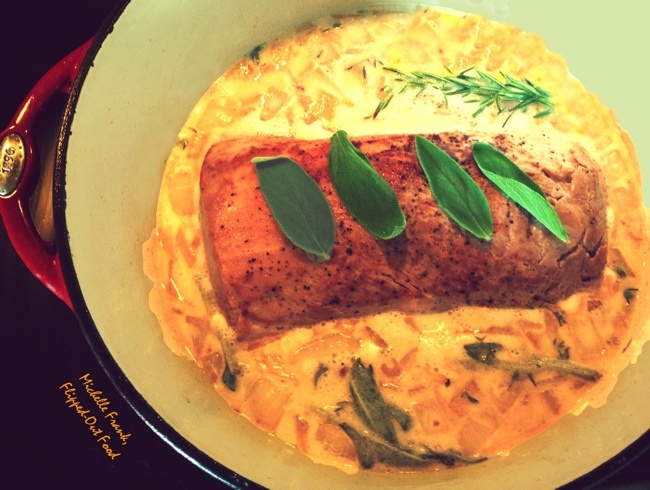 Milk-Braised Pork Loin is one of my favorite go-tos for an out-of-the-ordinary Sunday Dinner. In fact, it will likely be Easter Dinner this year, since I just get tired of ham—and this meal has fancy and flavor in spades. Braising in milk is a technique that was invented by the gods (OK, the Italians) to transform cuts of meat that are typically dry and/or tough into tender, juicy AWESOMENESS. Pork loin is just such a cut of meat. You can usually score a whole pork loin crazy-cheap at wholesale clubs: I cut them into quarters or thirds, then “Food-Saver” them to pull out for just such a meal as this. Although pork loin is quite the bargain compared to pork tenderloin, it’s fraught with its own set of perils—namely, it dries out quickly, then turns grey, tough, and…sad. That’s why we carefully, slowly braise it in milk. Not only is the meat tender and flavorful, but the braising liquid is packed with rich, meaty flavor. This gets reduced down until delicious, golden-brown clumps form throughout the sauce. Yeah, you heard me right. Since the braising liquid is milk, it has the pesky habit of curdling and forming clumps in the presence of acid (e.g., the slightly acidic pork juice) and heat. The finished sauce will have an incredibly complex, meaty, almost nutty flavor that’s completely delicious—but it won’t win any beauty pageants. So, if the clumps in the sauce are off-putting to you or your family, simply buzz it with an immersion blender (be careful to avoid splattering) before you serve it, continuing to simmer, if needed, until it’s the consistency you like. It’s really important not to overcook the pork. We are shooting for a braise that lasts until—and ONLY until—the meat reaches an internal temperature of 142° F. The meat will rise to 145° F as it rests. Remember the days when we used to cook pork until it had nary a trace of pink, but had turned grey and adopted the approximate consistency and palatability of a hockey puck? No more. The USDA changed its recommendations about cooking pork a few years ago. Forget about all of those old wives’ tales you’ve heard over the years about cooking the hell out of pork to avoid getting [fill in scary disease here…ok, I kid. It was trichinosis.]. Check out the USDA guidelines and relax. Pinkish pork is good. 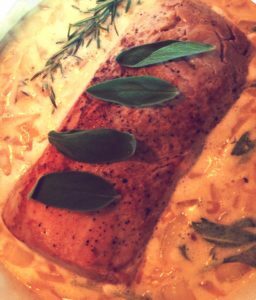 I like to serve milk-braised pork loin cut into thin-ish slices (e.g., no more than 1/2″), arranged on a platter and drizzled in sauce. If you’re a fan of comfort food, mashed potatoes would be a fantastic addition, as would polenta or even puréed cauliflower. I have eaten the pork over rice, or even with a salad on the side—and a crust of bread to mop up that fantastic sauce. And there you have it! Yet more proof—in meal form—that PORK ROCKS. This tender pork loin simmers in its own succulent sauce, flavored by onions and herbs. It's a perfect weekend cooking project for a special Sunday Dinner. The sauce isn't pretty, but you won't care. Any leftovers are fantastic during the week. Mashed potatoes, polenta, or even rice would be a lovely accompaniment. Set a large (~8-qt. ), heavy-bottomed Dutch oven over medium-high heat. Add the butter and oil. When the butter has melted and begins to foam, add the pork, browning on all sides (including ends, 8-10 minutes). Remove the pork to a plate. Reduce the heat to medium. Add the olive oil to the pot along with the onion. Sauté until fragrant and slightly translucent, about 1 minute. Return the pork to the pot—fat cap up—along with any juices that have accumulated on the plate. Add the herbs (except the sage) and garlic. Pour the milk over the top of the meat. Arrange the sage leaves on top of the fat cap. Raise the heat to medium-high to bring to a simmer, then reduce heat to maintain a gentle simmer. Lid the pot so that it's slightly cracked. Simmer, undisturbed, for 45 minutes. Check the temperature of the meat by inserting an instant-read thermometer into the thickest part. Continue simmering (partially lidded) until the meat reads 142 degrees F. Remove pork to a carving board, cover with foil, and allow it to rest for up to 30 minutes (minimum 15). Discard the sage. Remove any herb sprigs and large leaves from the pot along with the garlic clove. Discard. Simmer the liquid in the uncovered pot until it has reduced by two-thirds and you see golden-brown curds throughout sauce (~10 minutes). Season to taste with salt and pepper. Slice the roast into 1/3"-1/2" slices and arrange on a platter. Ladle the sauce over the top and serve. You can tie the herbs into a bouquet with kitchen twine if you'd like (leave the sage leaves out to place on top of the pork, and leave the bay leaf free). 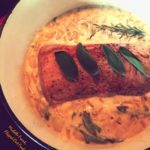 I have never tried milk braising, but I love a pork loin and this is the perfect recipe to try. Thanks, Janette! I hope you love it! My husband would love this, pork loin is one of his favorites. I would never have thought to braise it this way, I bet it’s delicious. Love all of those herbs too, especially the tarragon. This would definitely be a great way to switch up from the traditional Ham. OMG this looks phenomenal. Let’s say goodbye to ham and replace with this pork loin for sure.